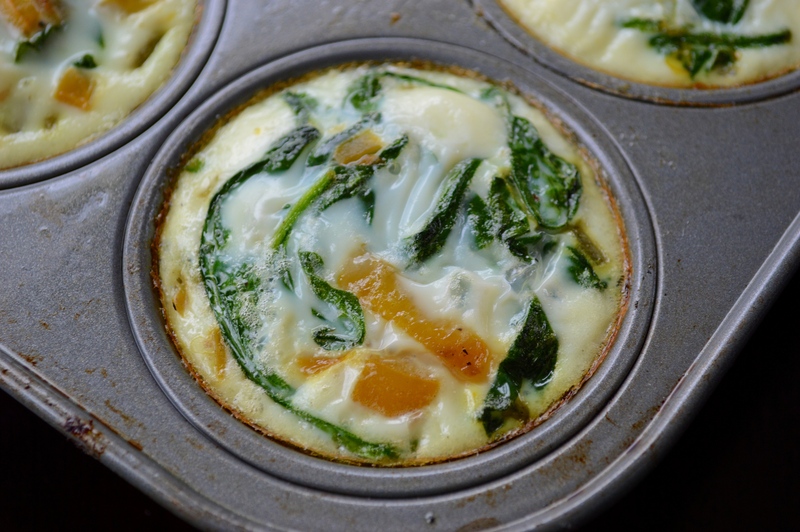 These are the best make ahead and take on-the-run breakfast ever. It’s so easy to make a batch of these to start the week off and have a healthy, filling and portable meal to take with you. I love to pack mine with some all natural turkey sausage and then just heat it up once I get to work. The cool thing about these is that you can customize the veggies based on what you like/what you have on hand at the time. 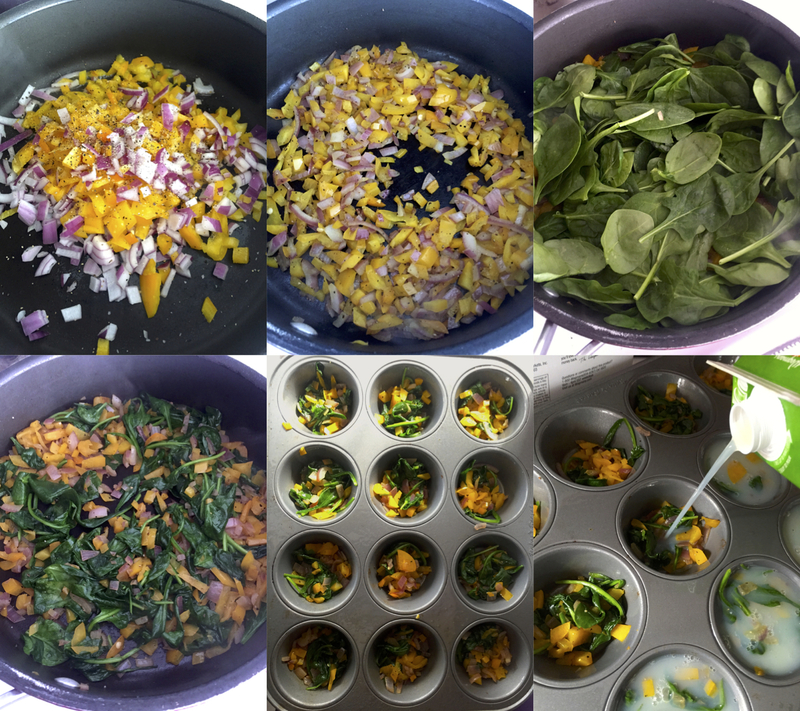 These ones have bell peppers, spinach + red onion but you could use any combo you want – you could even add meat if you wanted some extra protein. Buying cartons of egg whites saves you tons of time separating the yolks from the whites + saves you a lot of money at the same time. If you need some more inspiration to kick-start your days, check out all of my breakfast recipes here! Preheat your oven to 350 degrees and spray the cups of a muffin pan with a non-stick spray. Heat 1 tsp extra virgin olive oil in a medium sauté pan over medium high heat. Add 1 diced yellow bell pepper, 1/3 cup diced red onion + a large pinch of freshly ground black pepper. Cook until softened, while stirring occasionally, for about 3 minutes. Add in 2 large handfuls of baby spinach which equals out to 3-4 ounces and seems like a ton but you’ll see how much it cooks down. Cook while stirring until the spinach wilts, just a couple of minutes. Divide the vegetable mixture up evenly among the cups of the muffin pan. Take a 32 oz carton of egg whites and fill each cup up to the top. I didn’t need the whole carton, but close to it so you may not need all of it! Bake in the oven for 15-20 minutes until the egg whites are just set. You can undercook these slightly because you’ll be reheating them in the microwave once it comes time to eat them! Once the pan is cool enough to handle, pop the cups out of the pan and let cool completely before packing them in to tupperware. If they’re even a little warm then they”ll cause condensation in the container and become soggy! Preheat your oven to 350 degrees and spray the cups of a muffin pan with a non-stick spray. Heat olive oil in a medium sauté pan over medium high heat. Add bell pepper, red onion + black pepper. Cook until softened, while stirring occasionally, for about 3 minutes. Add in spinach which equals out to 3-4 ounces and seems like a ton but you’ll see how much it cooks down. Cook while stirring until the spinach wilts, just a couple of minutes. 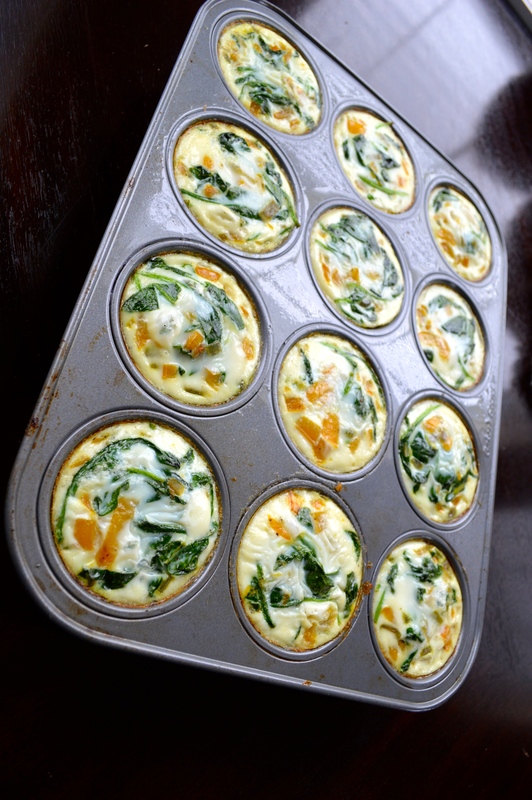 Divide the vegetable mixture up evenly among the cups of the muffin pan. Take the egg whites and fill each cup up to the top. I didn’t need the whole carton, but close to it so you may not need all of it! Bake in the oven for 15-20 minutes until the egg whites are just set. You can undercook these slightly because you’ll be reheating them in the microwave once it comes time to eat them! Once the pan is cool enough to handle, pop the cups out of the pan and let cool completely before packing them in to tupperware. If they’re even a little warm then they”ll cause condensation in the container and become soggy! Yes they are! I love them for taking in to work and getting a great breakfast in! They look very nice! It’s always hard to find healthy satisfying yummy treats at the office. So that looks like a winner to me! Thanks Sandra! Yes it is such a struggle so these are awesome for me!! I’ll have to make this recipe. I’m always looking for quick and healthy breakfast items to make. I bet egg beaters would work as well. You’ll love it if you try it and yes egg beaters would work great! I’ve seen this floating around. I am definitely going to try it because I almost never eat yokes anyway. Same here, it’s so easy to do and super yummy! I made these this morning. I added a little chopped mushrooms to the veggie mix. They were delicious! Thank you! I added mushrooms to the ones I made last week, SO good!!! Bethanie, it is similar to an omelette but a little spongier since they’re baked!! this is a great idea! I have to try this soon 🙂 Thanks for the recipe.